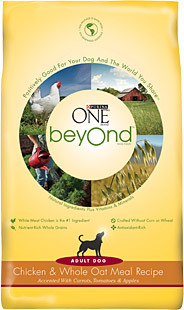 Purina ONE® is celebrating the launch of Purina ONE® beyOnd™ with a special Facebook promotion that will offer 250,000 consumers a coupon to try Purina ONE® beyOnd™ brand dog or cat food! On a first come first serve basis, consumers can log onto Facebook.com/PurinaONE to redeem a coupon for $2.00 off a package of beyOnd™ brand dog food or brand cat food (any size, any variety). Simply click on the “beyOnd Coupon” tab to download the coupon (limit of one sample per person). Both of these natural pet food recipes are made from ingredients like real meat, whole grains and accents of fruits and vegetables. The Purina ONE® beyOnd™ packaging also goes above and beyond to make a difference, using at least 92 percent renewable materials. For more information about how Purina is spreading goodness, please visit PurinaOnebeyOnd.com or check them out on Facebook at facebook.com/PurinaONE.